How to Watch M2TS TS on iPhone iPad without Conversion & iTunes? As we known, M2TS and TS files are commonly from Blu-ray Disc, JVC, Canon, Panasonic, Sony Camcorders, etc. But they can not be directly played on iPhone iPad. To watch M2TS, TS videos on iPhone iPad, usually, we need to convert M2TS, TS video to iPhone iPad compatible video formats and then sync converted videos to iPhone or iPad with iTunes. Say NO to MKV video conversion displeasure, now iPhone iPad fans can stream MKV HD video on the fly with Air Playit which is a video streaming App for streaming MKV to iPhone, iPad running no CPU. A free iPad 3 video streaming software called Air Playit allows streaming video to the new iPad 3 over WiFi and 3G/4G network, supporting 320 different video & audio codecs (including DRM-protected video) which make it powerful enough to play almost all videos regardless of the formats. Videos even in incompatible formats such as MKV, M2TS, AVCHD, AVI, WMV can be played on the new iPad 3 smoothly and instantly. Playing audio/video files in various formats on iPhone 4S may be obstructed by incompatibility, storage and Sync problems. 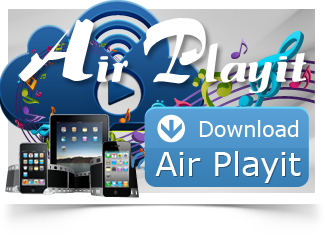 But there is a solution called audio video streaming, and a corresponding trouble shooter called Air Playit. After Apple finally unveiled the new iPad 3 release date, a free iPad 3 audio video cloud hit the market by streaming home audio video files to the new iPad 3. This article will tell you how to free download the personal audio video cloud for the new iPad 3.